StudyLink were recognised for demonstrating excellence in customer service at the 2018 British Youth Travel Awards (BYTA). Birmingham City School of Architecture and Design required a group travel package to Berlin where students could experience, first-hand, iconic designs and architecture from Europe to help develop skills in design and drawing, a methodical approach to planning, teamwork, and data analysis. StudyLink created a 5-day study tour package to Berlin, enabling students to explore varied styles of art and architecture, both modern and historical, throughout the city to gain visual inspiration and develop research for projects in the current and upcoming modules. After boarding a daytime flight to Berlin, the group was met by our coach for transfer to their accommodation. 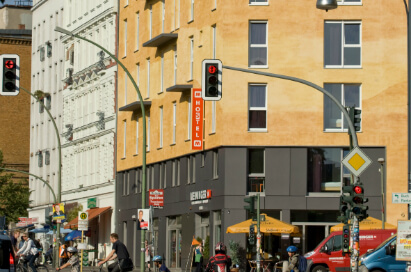 Staying at the Meininger Alexanderplatz, the group was based in the vibrant Mitte borough of Berlin and within walking distance of the chic Hackescher Markt renowned for its diverse street art and alleyways. Continental breakfast served at the hotel, group then travelled to the Neues Museum, where StudyLink had arranged a self-guided tour, and then on to the Reichstag building. Neues Museum is a restored historical building that is simultaneously a modern museum with the scars of World War II imprinted in its walls. Budding designers, exploring different cultural environments in search of inspiration, can wander the halls and discover collections of art and archaeological restoration. The Reichstag building is one of the most significant historical buildings in Berlin and is the meeting place of the German parliament. Its grand appearance gathers crowds throughout the year capturing images of its remarkable structure. Continental breakfast served at the hotel, group then travelled to the Jewish Museum for a self-guided tour, arranged by StudyLink, and on to the Memorial to the Murdered Jews of Europe. The Jewish Museum is described as an architectural masterpiece and has established itself as one of Berlin’s most recognisable landmark. The zinc-panelled exterior mirrors the tensions of German-Jewish history and encourages students to reflect on the impact history has on design. Memorial to the Murdered Jews of Europe is a place for contemplation, remembrance and warning. It is a memorial to the Jewish victims of the holocaust and is located in the city centre. The rows of concrete slabs, varying in height, allow students to fully immerse themselves in the accessible spatial structure and provide a memorable visit. Continental breakfast served at the hotel, group then travelled to Bauhaus-Archiv for a confirmed visit pre-arranged by StudyLink. The Bauhaus-Archiv is a museum of design that collects and presents all documents relating to the activities and cultural and intellectual heritage of the Bauhaus. Students can examine works by Lyonel Feininger, Johannes Itten, Paul Klee, Wassily Kandinsky, László Moholy-Nagy, Werner Drewes, Gunta Stölzl and Oskar Schlemmer. Continental breakfast served at the hotel, the group were met by our coach provider at their accommodation and travelled to Berlin-Tegel International Airport, arriving at Birmingham International Airport. Our room rates are guaranteed too, so you can reserve your beds whilst you confirm your passenger numbers. A medium sized youth hotel with 90 rooms, centrally located. This property provides bright, modern rooms in a friendly, relaxed atmosphere. View accommodation here. A large hostel with 235 rooms, centrally located in Berlin. The lively hostel has colourful rooms and welcoming and informal atmosphere. A very large, centrally located hostel. Recently refurbished to a good standard, this property provides modern, bright rooms and an informal, relaxed atmosphere.